All dependencies should be resolved automatically. Ubuntu in particular don’t allow logins by the root user by default. However, the user created at system installation time can use sudo to switch to root. Webmin will allow any user who has this sudo capability to login with full root privileges. This is very Easy to configure most of the servers and Enjoy your new Ubuntu 10.04 LAMP Server. I like the font in your webmin screenshot. Which font is it? I like how the screenshots are all distorted and warped. webmin is a great alternative to a full [GUI] Desktop Environment. I love it. Just a comment: on my version of Ubuntu server 10.04, the apt-get option not to install all recommended dependancies is “–without-recommends” (instead of “–no-install-recommends” as you suggest). Thanks so much for the tips on installing webmin. I’m new to setting up a ubuntu server and it is a huge help for me. I installed webmin on my newly install Ubuntu server 10.04 how to take access of webmin from other machine as I’ve not install desktop package for server. Make sure to open port 10000 on your firewall/gateway. i have to install oracle 11 g on ubuntu 10. It seems i need a GUI based installer. .If that is so,how can I access GUI using putty. I have only remote connections. 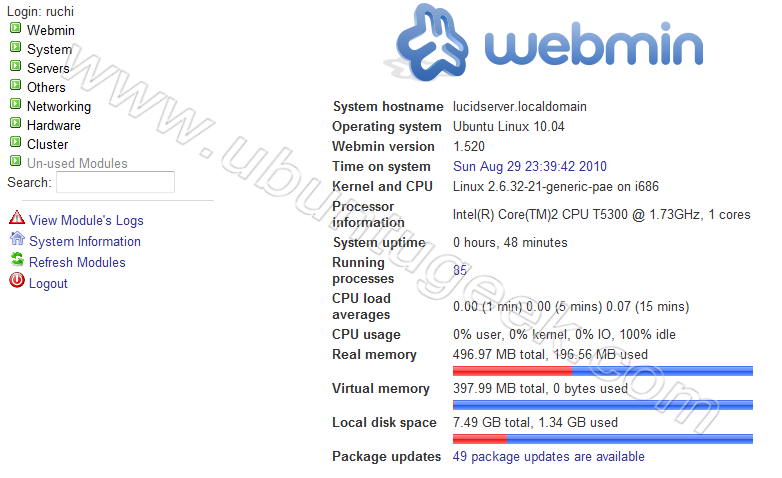 Getting both Ubuntu Desktop and WebMin installed was a great help to me. hey guys, i just want to know if you can run the terminal from webmin? @Luci, yes you can run a terminal in webmin. But better still, if you are accessing your server remotely via webmin, why not use any of the dedicated terminals for linux or putty for windows? About GUI, VNC is for remote desktop GUI connections. You can administrate your server without a desktop GUI but with webmin because webmin is a web user interface not a remote desktop server. can you please give me a name? also you said you can run terminal from webmin how? do you mean Others\Text Login? one more question if you don’t mind? how to set webmin to auto-start whenever the server reboots? @Luci, If you are accessing webmin remotely, you can use Others\SSH login. By “why not use any of the dedicated terminals for linux or putty” I mean if you need to use a terminal then fire up gnome-terminal, konsole, terminator, lxterminal etc. as in you can use separate terminals in combination with webmin gui. i don’t have the GUI interface on my server! so you mean if i want to use gnome-terminal from webmin i have to have gnome desktop on my server right? SSH login doesn’t work for my i tried it but every time it asked for username/password I type in them in and all i get is Not Connected … Offline !! You have two options. Install a minimal gui in your server and use webmin from there i.e sudo aptitude install –without-recommends ubuntu-desktop and then install webmin or..
the better option. Install webmin in your server and access it remotely i.e from onother computer. This option is what i’d recommend. U dont need a dekstop gui in your server to install webmin. is there a way to fix the SSH login? i checked the SSH settings and nothing looks unormal ! couldn’t fine a way to install putty !! i have ubuntu and the site you sent is for unix .. i’m not into unix..
webmin offers a way to SSH to server .. i dont know why it doesn’t work?! Sigh.. Putty is majorly a windows program. You previously said you are on windows so that’s why I recommended putty for you . Use putty to ssh into your ubuntu server. Install Putty in your windows computer, not your ubuntu server. but i do like webmin interface and the tools… well put together. i will see if i can get the SSH from webmin to work. Make sure your ubuntu’s firewall allows ssh connection. Allow input on port 22 or whichever port you’ve assigned ssh to. You can use webmin’s linux firewall for that. Linux firewall is in the networking category of webmin. Also make sure the ssh is installed and the service is running your ubuntu server. To run ssh from webmin, use ssh in others category. U need java to run ssh in webmin I think. i was able to ssh into my server using putty 😀 but not with webmin ! !